Ham Radio Raspberry Pi AA6E Tiny Python Panadapter | The Wonderful World of Microcontroller! The Experiment: In this experiment were going build, the AA6E Tiny Python Panadapter. To get things started, will use the M0JMO Tiny Python Panadapter for Raspberry Pi – Setup Guide. From experience most of the project found on the internet won’t work, unless the OS / Software / Hardware are identical to the OS / Software / Hardware used in the Setup Guide. So will expect to spend some time getting this to work. Will use Raspbian Wheezy (Instead of NOOBS) and a 5inch HDMI/LCD/Touch Display with a hopefully a cheap USB Sound Card. Nov 2, 2015: Learned something today, cannot use the USB sound card in the photo, because RX/IQ require’s 2(two) Mic inputs or a Line-in input. Cheap PC USB sound cards only have 1(one) mono Mic input so they can’t be used. So ordered a Behringer UCA202 which has 2(two) Mic inputs and should work (not a the cheap option), also orders a Vinyl Cassette To CD/MP3 Converter – USB Digital Audio MP3 WMA WAVE Recorder, it has 2(two) stereo Mic input, but don’t know if it will work with Raspberry Pi, if it does work this might be a cheap USB sound card option for the Raspberry Pi Tiny Python Panadapter. The Behringer UCA202 skip (Step 18-19) from the installation instructions. Will see what need to be done for the Vinyl Cassette To CD/MP3 Converter – USB Digital Audio MP3 WMA WAVE Recorder. Nov 11, 2015: The Behringer UCA202 and the Vinyl Cassette To CD/MP3 Converter – USB Digital Audio MP3 WMA WAVE Recorder arrived today. First thing plugged in the Vinyl Cassette To CD/MP3 Converter – USB Digital Audio MP3 WMA WAVE Recorder into the Raspberry Pi USB port, then launched pa.py to see if Raspbian Wheezy found the USB sound card. Well it did and it showed maxInputChannels : 2(two) / maxOutputChannels : 0(zero) / defaultSampleRate : 48000.0. So Updated Step 18 – 19 channels to 2 and updated r.sh rate=48000. Launched r.sh and turned On RX I/Q in the KX3 and wow it’s working, a little slow, but did not over clock the Rasberry Pi. So there is a cheap USB sound card for less then $10.00 which will work with the Tiny Python Panadapter. Not even going to try the Behringer UCA202 USB sound card I that should work. Vinyl Cassette To CD/MP3 Converter – USB Digital Audio MP3 WMA WAVE Recorder. Will pickup a USB to TTL adapter and try the Hamlib functions. Step 6. Make sure to past all in one line. Step 21. Past in code below make sure it’s all in one line. Again make sure it’s all in one line. Step 26. Type: startx (This will launch the GUI desktop) it’s best to do all the testing in LXTerminal. If you do the testing at command prompt you won’t see the ERROR messages. If all working in LXTerminal then you can launch Tiny Pyhton Panadapter from command prompt /home/pi/iq/bask r.sh it will display in a full screen see photo. Use pa.py in /home/pi/iq directory to get the information for the sound card. 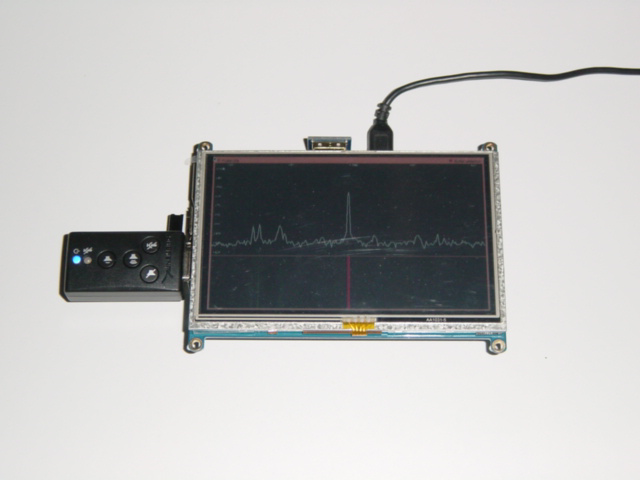 Snip-it of the USB sound card info displayed with pa.py. In Step 18. SCREEN_SIZE(800, 480) the size of you HDMI screen. It was nice to to find cheap USB sound card for the AA6E Tiny Python Panadapter experiment. Without the enclosure the total cost less then $100.00, because of all the unknowns still spent less then $150.00. What’s nice about the Vinyl Cassette To CD/MP3 Converter – USB Digital Audio MP3 WMA WAVE Recorder, is that it can plug right into the KX3 with a 2.5mm to 3.5 mm stereo phone adapter.